Kubota X900 won't go into neutral? I suspect a lot of my fiction will be totally unappealing to my non-fiction audience. But Verdant Magic might possibly bridge that divide. 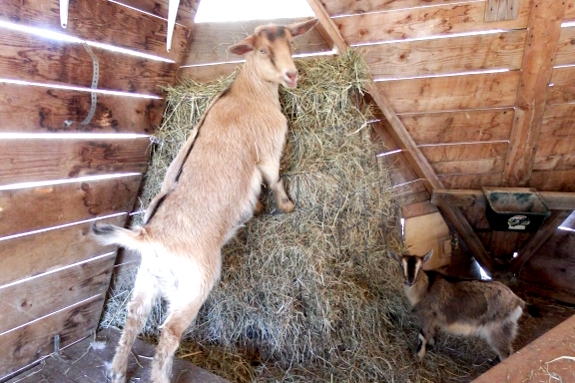 The heroine is basically a homesteader...who just happens to have magical powers to go along with her goat sidekick. Amber battles kudzu and other unruly plants...which, okay, I'll admit happen to have turned sentient and taken over the world in my fantastical future. And, sure, there are dragon shifters and danger too. But it's really just homesteading...right? 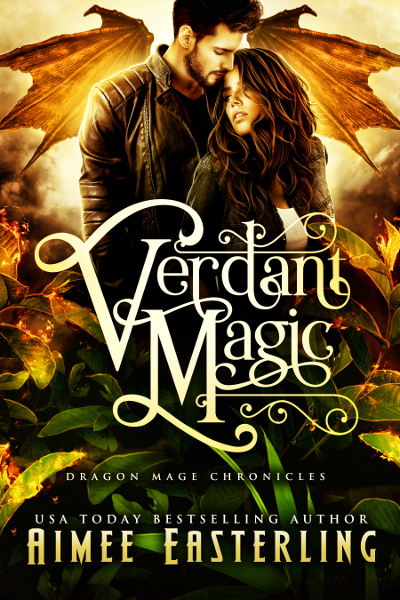 In case you want to give it a try, I've set Verdant Magic to 99 cents for launch (and it's free to borrow in Kindle Unlimited). Enjoy! 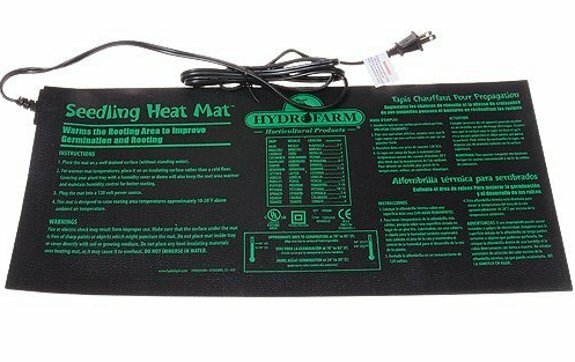 It's been a year since we upgraded to these seedling heat mats from Hydrofarm. That little bit of heat seems to make a big difference during this time of year. 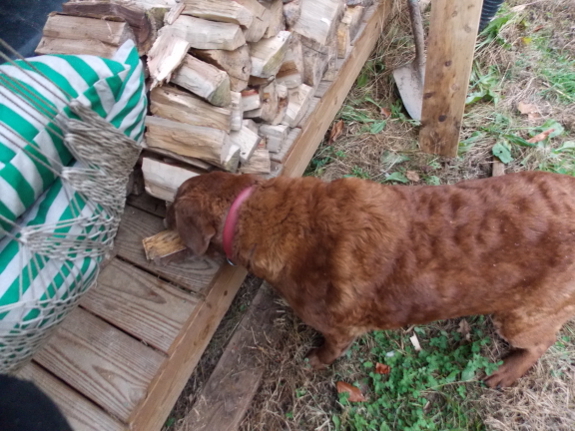 I think Huckleberry likes them even more since we let him use one during the Winter to stay extra toasty. What do we have planted in our new seedling nook? 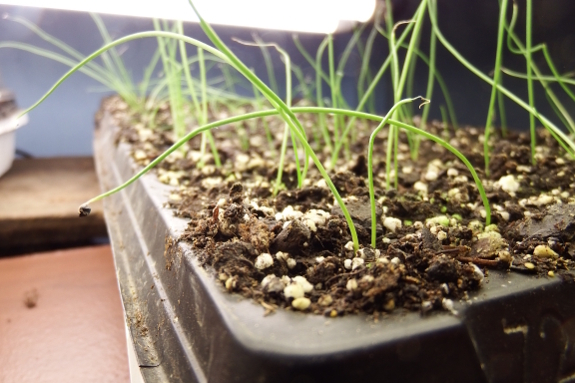 The baby onions are up and running and I just seeded a flat of broccoli. 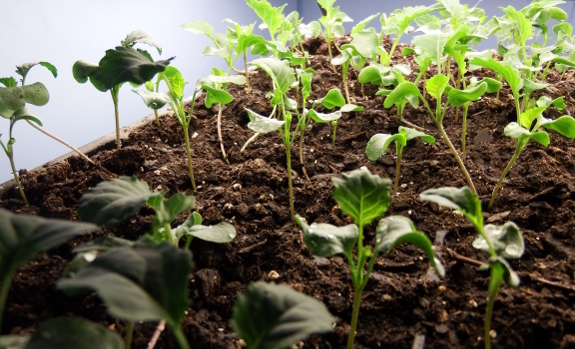 I filled half of another flat with peppers then added some other slow germinators --- parsley and swiss chard --- to round that one out. Two more weeks until I start tomatoes and basil! 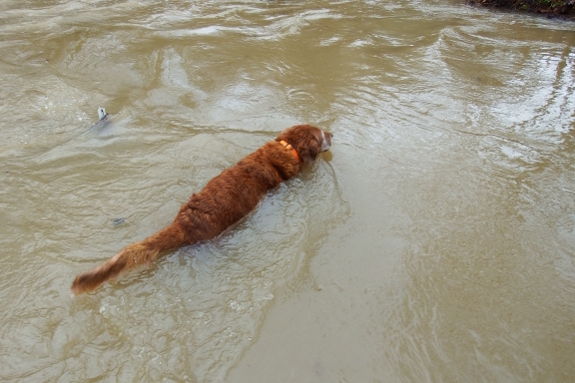 Yesterday's heavy storm brought in enough extra water to flood us in. Mom's local paper reports that the leaves in Bristol, Tennessee, are a full month ahead of schedule. The only leaves we have here are tiny fresh growth on multiflora rose, autumn olive, and Japanese honeysuckle. 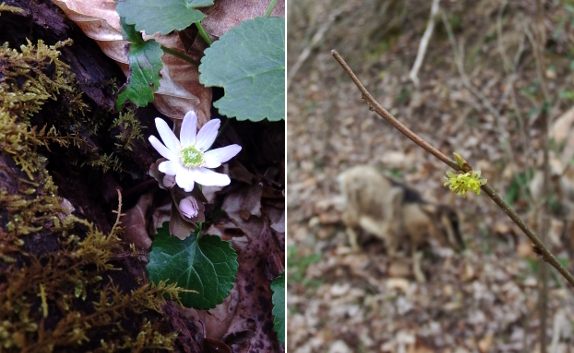 But I can gauge spring's advance based on the pear buds (breaking open for about a week now) and the gooseberry leaves (which have been pushing gently out of buds for a little longer than that). So we're not a full month ahead of schedule (unless you measure us by 2015), but our plants are precocious by at least two weeks. I guess the question becomes --- do we push our planting calendar up an equal amount or figure there will be sudden cold spells up to our usual frost-free date and hold the usual line? The straw bales we got back in the Fall turns out to have seed heads. We might be able to use the new flame weeder to destroy some of the seed heads. I'm afraid I can't yet say that I've figured out how to take a passable photo through glass. But life in the aquarium is otherwise going swimmingly. My two minnows and one caddisfly larva were soon joined by ten tiny tadpoles (who they promptly ate) and seven snails (who got busy cleaning the glass). 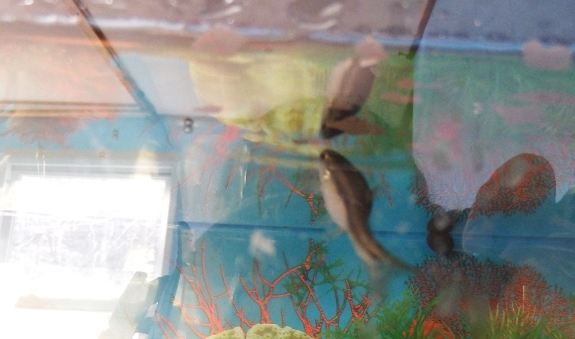 And Friday I figured out why one of the minnows has a tremendous belly --- that fish finally learned that flakes on the surface are yummy and is now eating them as quickly as they appear. Chemically, the pH is still high (8.0), but the biological filter is obviously doing its job well because there's barely any ammonia and no nitrite or nitrate in the water despite daily feedings. Perhaps I should add a few more fish? Thank you Eric and Roland for the helpful comments on our sad truck. Yes....I agree that it's getting time to consider a newer truck and yes I also agree that a replacement tank might be the best solution to fix it up for now. It was patched a couple years back and maybe having it towed recently damaged that patch. I've heard good things about the Toyota Tacoma. 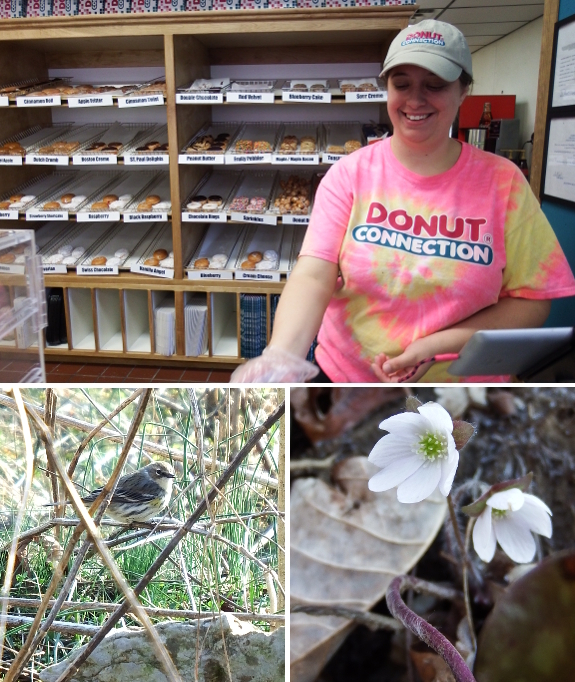 A donut shop moved into St. Paul a few months ago and Kayla picked up a part-time gig as donut pusher. Time to drop by and see what the fuss is about! A chocolate donut, a chat with a good friend, and a followup walk at Sugar Hill made for a pretty perfect Saturday morning. The highlight of the last phase was a full chorus of meadowlarks (not pictured) on top of the hill --- well worth a visit for that alone! Our garlic is doing good despite our renegade chickens destroying the mulch cover. 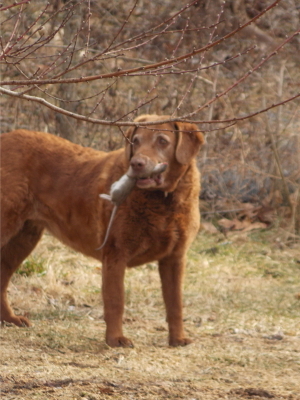 Edgar is quickly finding his niche on our farm. He still drops his belly down when I try to pet him...but Aurora says that's not a bug; it's a feature. After all, she could stand for hours and let me brush her, especially at this time of year when she's shedding her winter fluff. 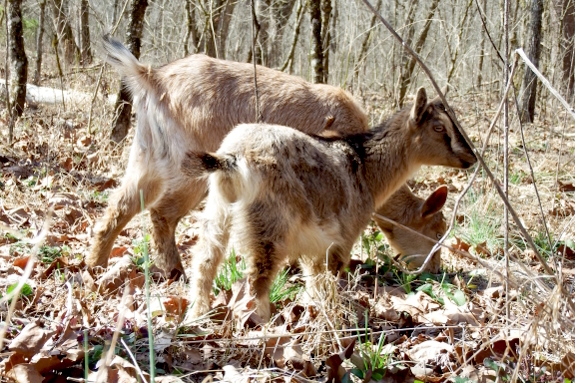 Why do I need another pettable goat on the premises exactly? Elsewhere, our new wether is proving to be equally adaptable. 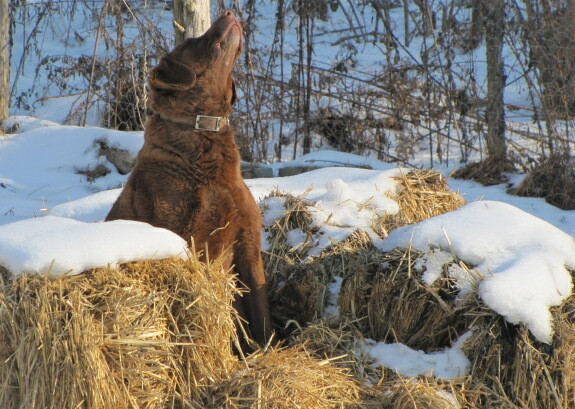 For the first week or so, I gave him fresh hay on top of his safe spot --- the dog kennel where he eats breakfast far from Aurora's overeager head butts. But then I realized the imperfect hay that tends to build up in the bottom of our manger was disappearing for the first time ever. Sure enough, a little sleuthing turned up what was going on. 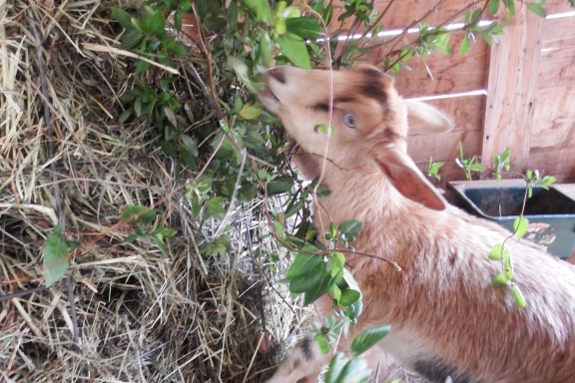 Unlike Aurora, Edgar isn't so spoiled he considers only a tenth of the hay worth eating. That means he's basically a net plus in the feed department since he saves me from having to clean out the bottom of the manger. Score! Out in the pasture, Edgar is teaching Aurora some good habits --- like actually, you know, eating in the pasture rather than just waiting for their daily out-of-pasture graze. 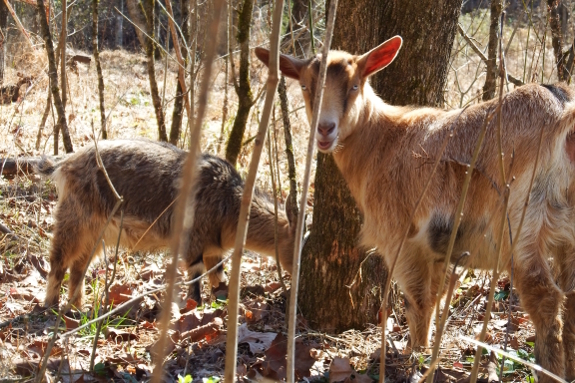 On the other hand, our new goat is a serious bark eater, so I'll have to keep a close eye on him if I ever decide to tether him near fruit trees. As a side note, a couple of you have commented on his size --- pretty darn puny compared to our doeling who is his exact same age. "Will he get any bigger?" you ask. I'd say he will since he grew slowly with pretty much no access to concentrates and without the extreme milk bar Aurora enjoyed. That said, he is a pure Dwarf Nigerian rather than sharing Aurora's 1/4 Nubian blood, so I'd expect him to always trail behind her in bulk. Edgar's other interesting trait is --- he's a nibbler! Hold out your fingers and they end up in his mouth. I guess that's better than running away when I get close, right? We tested the new flame weeder out for the first time this year. Stay tuned tomorrow to see what kind of results show up after a day. 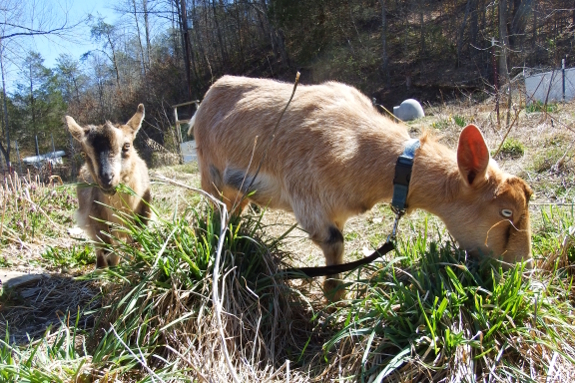 The goats and I headed to the creek Sunday afternoon to find more life to add to my aquaponics setup. The first catch came in the still waters of our so-called alligator swamp. (No, there are no alligators in southwest Virginia.) Two overwintering Green Frog tadpoles were easy to scoop up and are definitely big enough that they won't get eaten like the baby Wood Frog tadpoles did. 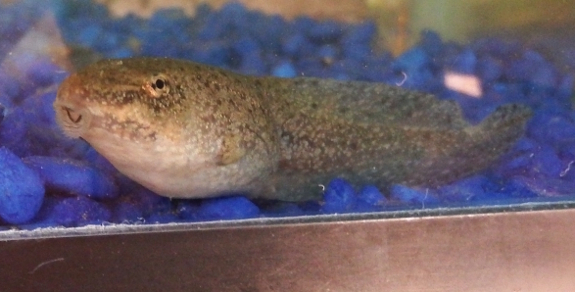 After all, these tadpoles are bigger around than their neighboring fish! 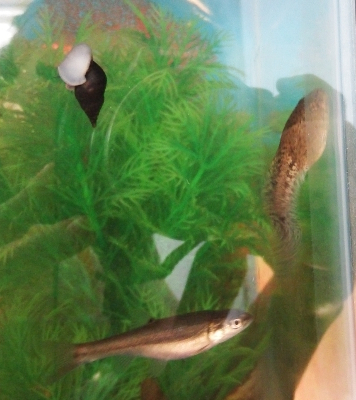 Speaking of fish, I doubled our school with two more scooped out of the same spot in our smaller creek. Without knowing their species, it's tough to find much definitive information online. 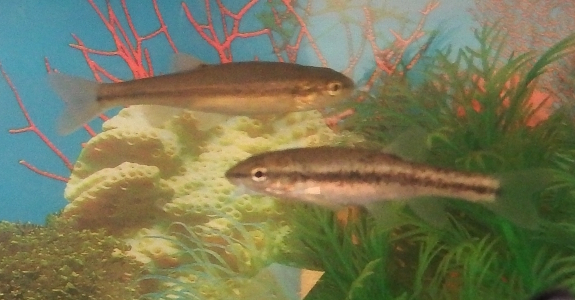 But if they're anything like Longnose Dace, then I have two juveniles (with firm dark lines down their sides) and two adults. I have a feeling that Rae might be right and the big-bellied adult is a pregnant female. If so, we'll just have to hope the other adult is a male since dace apparently fertilize eggs externally after they're laid. No males in sight would mean no babies. Maybe I'll get lucky and catch the mating dance in action? One of the thin CFL bulbs stopped working recently on the aquaponic experiment. I think this new shorter but thicker CFL bulb will give more total light. If you've got a small garden or just a widespread wish list, it's tempting to start several varieties of seedlings in the same flat. That can work...just as long as you don't put fast- and slow-sprouters together. In my slow-sprout flat this time around, I included swiss chard, peppers, and parsley. Looks like of those three, the last is the slowest to emerge. If I don't see their pointy little cotyledons soon, I'll take the lid off anyway so the first two species don't succumb to damping off. Always compromises in the garden! Step one on making the new wheelchair chicken tractor is to extend the width. I secured a 40 inch 2x4 at the top after cutting the two metal brace poles. They say you can't really tell the effects of a flame weeder until the next day, so I went back twenty-four hours later to see how Mark's test plot fared. This was a moderate-level request of the tool --- trying to kill perennial weeds, but low-lying, unvigorous ones that had popped up on a fallow bed through the course of the winter. Did the Weed Dragon do the trick? No. Chickweed didn't even appear singed while the other weeds looked no worse than they might after a very hard freeze. I'd be curious to hear from those of you who have already experimented with these devices. Are they really just for tender new seedlings, or have you used a flame weeder to knock out more heavy duty weeds? The new fuel tank also needed the sending unit which was an unpleasant shock. "Hi, Anna--I'd forgotten the role of the sheep bell wether: to lead the herd, since the wether is the most trainable!!" I'm ashamed to say that I didn't believe "bellwether" was referring to a neutered male animal like Edgar, so I looked it up. And, as always, Mom was right! What an interesting peek into the utility of wethers, dating back to the fourteenth century. Extending the support brace with a smaller pipe helped to firm up the design. 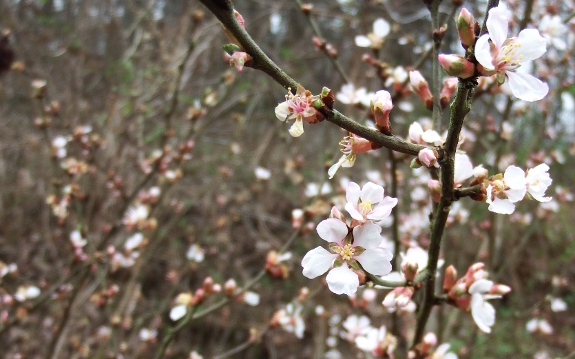 Nanking cherries bloom on our farm before any other fruiting plants...which is pretty but tends to mean we don't get any fruit from the bushes. Now that Aurora is the Alpha goat she's decided to let me pet her. I'm still working on earning Edgar's trust enough to scratch his head. While my minnows continue to thrive and fill me with joy, I have to admit that the plant-life in the top of the aquaponics setup is far less inspiring. Egyptian onions bit the dust (probably due to overharvesting), celery is growing as slow as molasses, and my squash plants are trying to bloom while their bush is only about eight inches in diameter. What's the deal? I suspect the problem was twofold. After my first failed attempt at adding fish...I just gave up for a few weeks. So there were basically no nutrients in the water at all, a problem that should be correcting itself now that I'm feeding my minnows up to half a dozen tiny pinches per day. Around the same time, one of the lights also burnt out, which Mark only replaced this week, so low light was likely also a culprit. Maybe in a week or two, we'll finally start to see lush top growth above to match the vibrant stream ecosystem below. I'll be sure to keep you posted either way. The spot we grow herbs is producing year two of Oregano for us. Wendy Trehus wrote in last week to share her experiments with a hot frame created out of a 55-gallon drum combined with a water-bed heater. She began by creating a wooden box out of 2x6s on the ground, within which she laid a sheet of foam insulation. 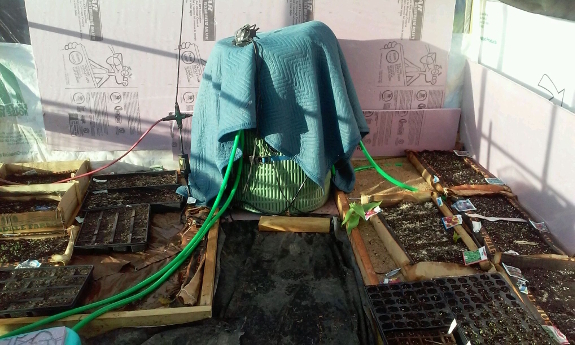 Atop the insulation, she snaked a garden hose, then backfilled the bed with sand. Both ends of the hose were left outside the box. 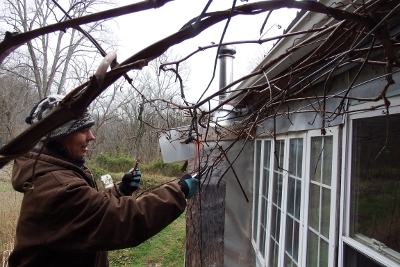 Next, she filled the 55-gallon drum with water and taped the water-bed heater around it followed by a couple of heavy blankets for insulation. 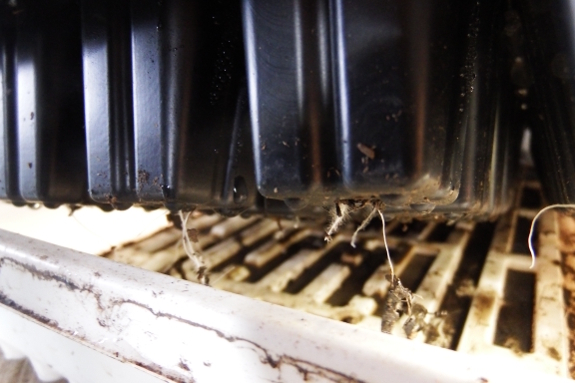 After cutting a hole in top of the drum, she inserted a sump pump and attached it to the water hose to circulate beneath the sand bed. A timer turns the pump on and off every half hour. Seed flats on top of the sand bed enjoy bottom heat (about 65 degrees Fahrenheit). Within an unheated cold frame in Texas, the bit of warmth is enough to get her seedlings off to an excellent start outdoors. Sometimes a project like the new chicken tractor goes smoother when using all three drills and the reciprocating saw. 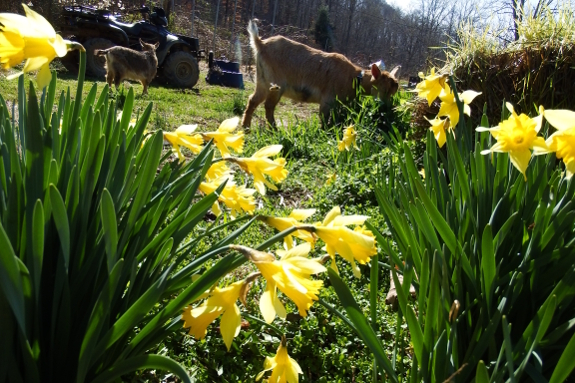 March is the month of perennials on our farm. Pruning, weeding, topdressing, mulching --- all fun tasks to slide into the warm afternoons that crop up at least a few times a week. 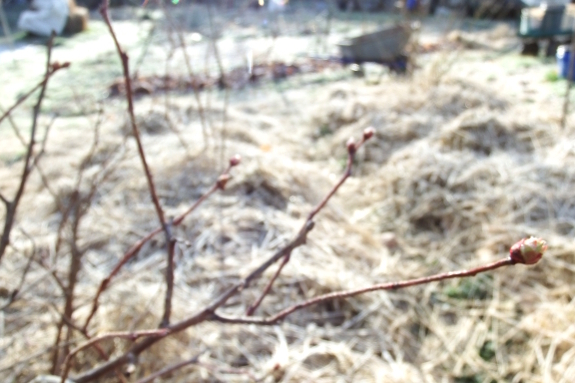 While I'm at it, I took a look at my one perennial experiment of the year --- budded plums. 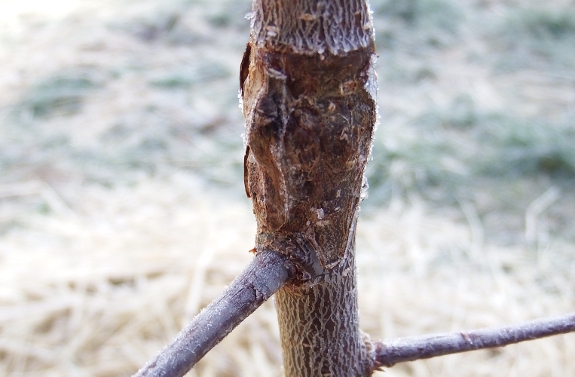 I grafted two buds per rootstock last summer, and it looks like that was just right since one of those buds (generally the top one) seems to have glued itself into the rootstock fairly well. 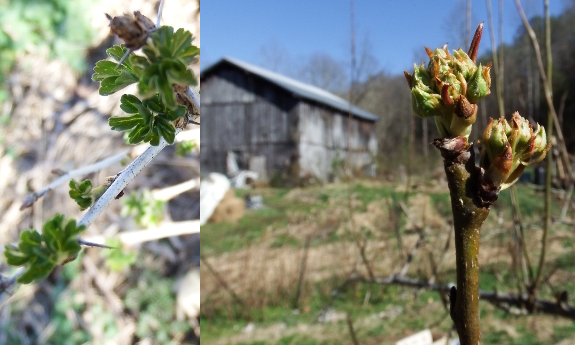 I snipped the tops off the small trees to talk them into turning those grafted buds into shoots and will wait and see what progresses over the course of the growing season ahead. I secured the bottom support piece by drilling holes in the wheelchair foot rest and then used treated deck screws to attach them together. What's wrong with this photo? I'll bet you can't guess! Either Edgar's started laying eggs or our rascally chickens have taken their hidden-egg caches to another level. Good thing Mark's building a chicken tractor to keep our unruly flock in its place! The grapes on the trellis on the south side of the trailer are growing so vigorously that they finally needed some serious pruning. 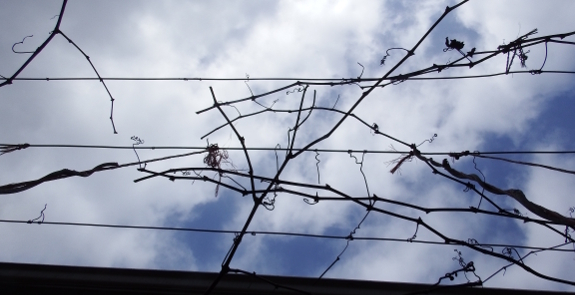 I took the existing tangle and snipped back vines so each strand of wire supported a single vine coming toward the center from each direction. The best part of early spring pruning is that I begin dreaming in color. Soon the winter gray will be gone and this trellis will once again be shading our south-facing windows while plumping up sweet grapes. Maybe in 2017 we'll get quite a few more fruits than last year's one delicious cluster? We like to water our baby sprouts every three days at this time of year. Scientists don't like the term "global warming" because not all areas are getting hotter. And even spots like ours where the average temperatures are rising showcase a much more prominent change --- more climate extremes of both sorts (highs and lows). The smart way to react in the garden is to resist jumping on the early-spring bandwagon or the out-of-zone-perennial bandwagon, no matter how tempting they both might be. 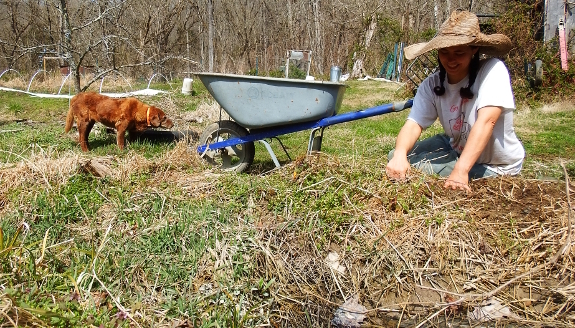 I've been dragging my heels despite warm weather, planting at my usual times, and was very grateful for that fact when the mercury dipped to ten degrees early Thursday morning. I might even have to replant the spring lettuce that's just barely germinating beneath the quick hoops --- luckily a handful of seeds is easy to scatter. Thank goodness none of our fruit trees have yet bloomed! I recently picked back up the recorder after dabbling in it briefly in fourth grade and college. Interestingly, the experience is very different this time around. Sheet music lessons my mother gave me when I was a kid suddenly click into place. (Well, some of them.) I realize the recorder is the childhood instrument of choice because running up from the bottom to the top is a scale starting at C and ending at B. And, on the negative side, my cats remind me vocally that shrill noises aren't necessarily pleasant on the ears. 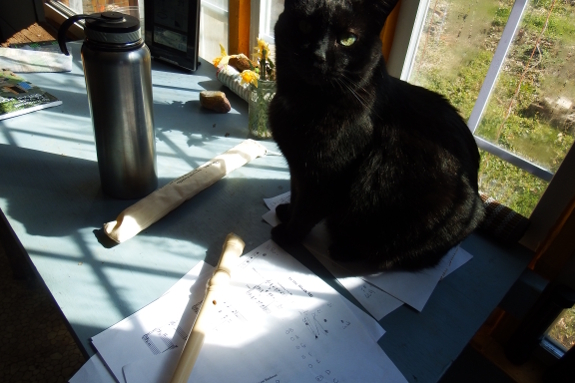 Here, Huckleberry is doing his best to cover up my sheet music so I can't play. Strider is hiding under the trailer waiting for the caterwauling to stop. 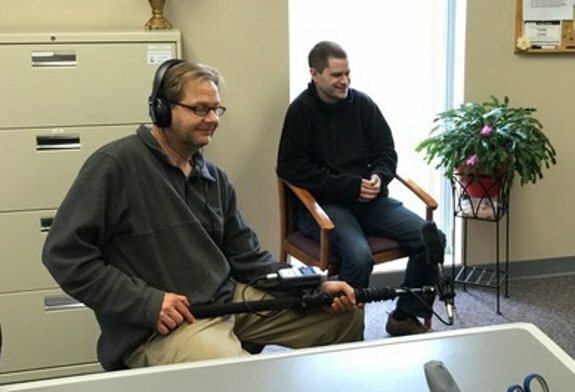 A recent film school project where I helped record sound for some interviews with Goodwill Industries in Kingsport. 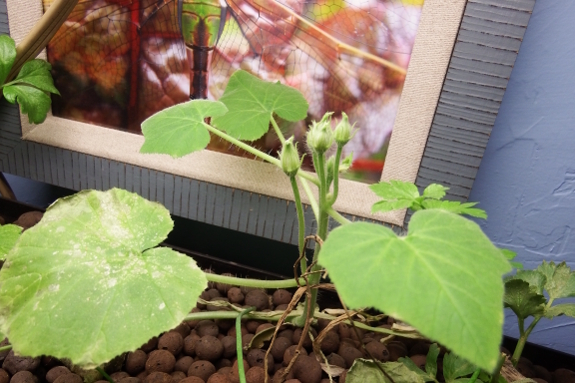 My inside seedlings took off like a rocket after Mark built them a special spot under the elevated sofa complete with fluorescent lights. The only trouble is...the broccoli is already growing out the bottom of the flat and searching for real dirt! These babies aren't supposed to move to the garden for another three weeks, but I'm already discarding my own advice and considering setting them out early. After all, one ten degree night aside, it does appear to be an early spring. Right? The willow cuttings Anna planted two years ago have more than doubled in growth since last year. 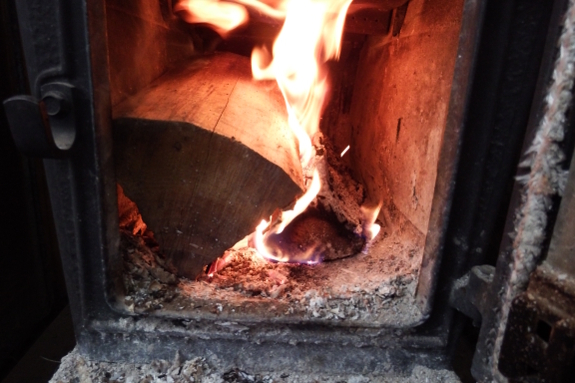 I was a lazy, lazy homesteader this fall. Well, actually, I was too sick to do many of my usual tasks, so I let most of them slide. But the results are the same. I didn't mulch bare spots in the garden. I didn't put away all of the sprinklers. And I never got around to hooking up the backup heat in the fridge root cellar. 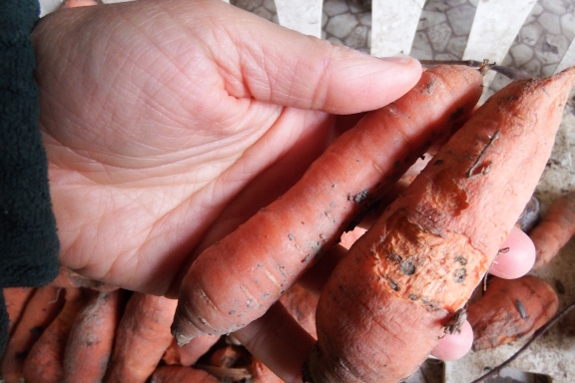 The good news is, the winter was mild and our carrots didn't rot despite (I suspect) freezing solid a few times. The bad news is...voles got in and nibbled on the last half bushel, turning them into goat fodder rather than human rations. If you're following along at home, I'm now pretty certain that those of you in zone 7 (one zone warmer than us) can count on a fridge root cellar doing its job without supplemental heat. Just make sure to check your screens and latches to keep the rodents at bay! mark Kubota X900 won't go into neutral? Sometimes the Kubota X900 shift lever gets stuck. Turning the steering wheel all the way to the right and then the left frees it up. These aren't the first flowers I saw in 2017. But they are the first flowers I saw on the first day of spring...which makes them the first spring flowers, right? Happy day after the spring equinox, everybody! The latest egg hiding spot for our renegade hen is underneath the bee hive box. The cold snap has passed, and now warm weather is once again tempting me out into the garden. Good thing too because it's finally time to plant carrots and peas. This year, I'm trying a hybrid approach to my pea-planting. I was excited by how well inside-started seeds did in the garden last spring...but a bit daunted by the idea of starting several flats of peas to hit our full quota. But what if I direct-seed the rows, then fill in gaps with inside-started seedlings? To that end, I filled about two-thirds of a flat with peas (the other third going to basil and tomatoes) and soaked the rest of the packet to go straight in the ground. Of course, you probably already see the problem with this plan, which I only noticed as I wrote this post. Inside-sprouted seeds will come up significantly faster and may need to hit the garden before soil-started seeds have poked their heads above ground. Oh well, live and learn! The big horse manure delivery we got back in the Summer is still paying dividends. We got 12 buckets today for the Spring garden. 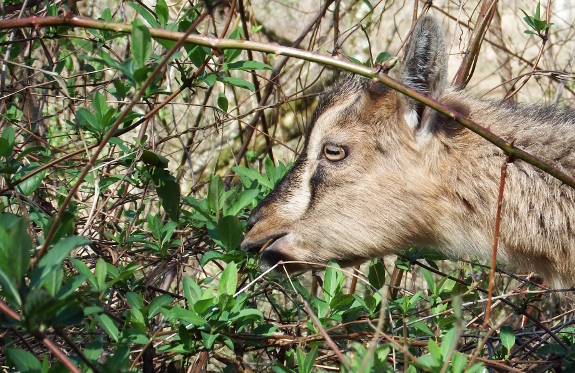 Has anyone out there ever dealt with goat external parasites? I think Aurora must have picked up some kind of biters, because she's been acting funny for the last few days. She'll be grazing quite happily...then she leaps and stomps and runs as if trying to evade a wasp. Unfortunately, there never is a wasp, so she can't escape. 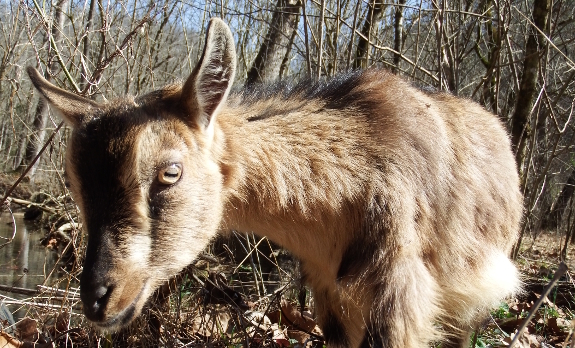 Have any of you experienced goatkeepers dealt with anything similar? The internet suggests that if we do have some kind of external parasite, we could try shaving her, treating her with diatomaceous earth or various insecticides, or just leaving her alone on the theory it'll likely go away on its own. Pre Beloved-goat-fading-away-to-die-a-terrible-death Anna would have shrugged and figured Aurora would fight it off on her own, while Post Bcfatdatd Anna is considering setting up a vet appointment for what is likely only a minor ailment. Reality checks accepted and appreciated. 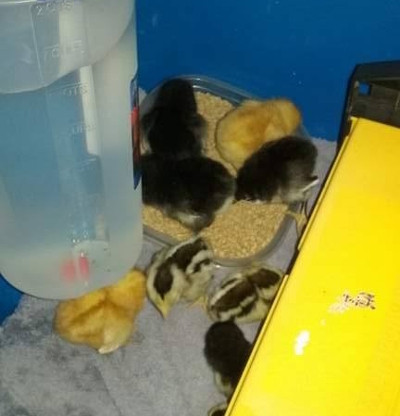 Kayla's niece, D.D., was kind enough to foster our chicks this year. 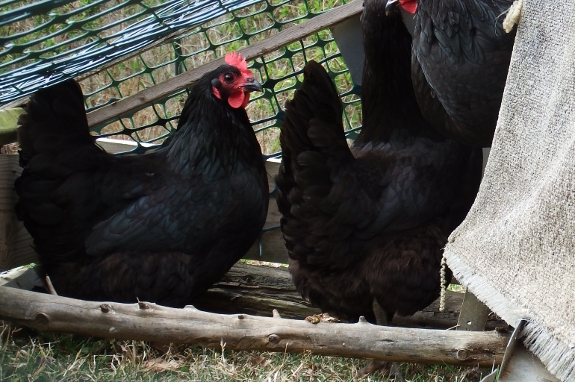 We set her up with the Australorp layers we prefer along with Red Star females and a Phoenix rooster to start her own flock. 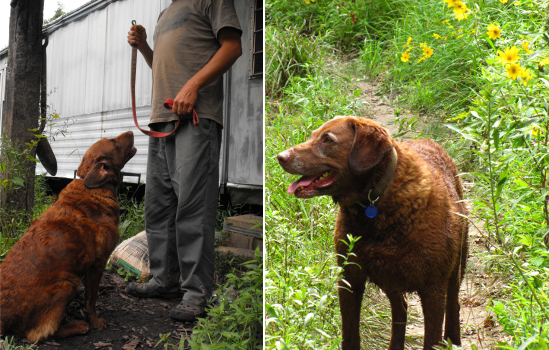 Thanks, D.D., for taking some of the pressure off our spring farm. Kayla is one of the best people I've ever met at finding free and fun activities close to home. This time, she rustled up an adult art class funded through the 21st Century Learning Center grant program. First installment --- pottery! I realized two things as I tried to remember how to throw a pot. First --- it's been over twenty years since I last put fingers into clay anywhere other than the garden. 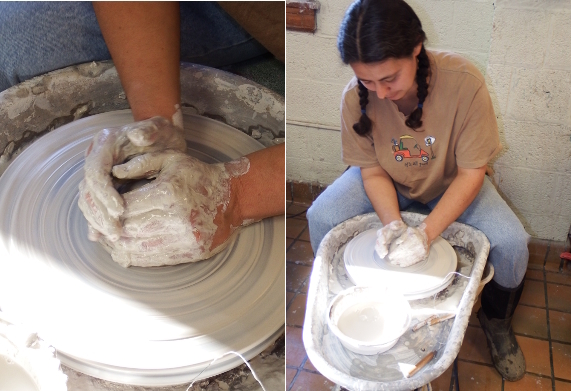 Second, my teenage self had no idea how centering it is to center a pot. I spent two hours coning and centering my clay, rarely bothering to open a pot and never keeping a finished object. And I came home so serene and fulfilled that I enjoyed the best night's sleep I'd had in over a month. Thanks so much for letting me come, Kayla and D.D.! Now to take that lump of homework clay and turn it into an actual object rather than a bowlful of slip. The chicken tractor waterer will sit in the middle to distribute the weight of the water. 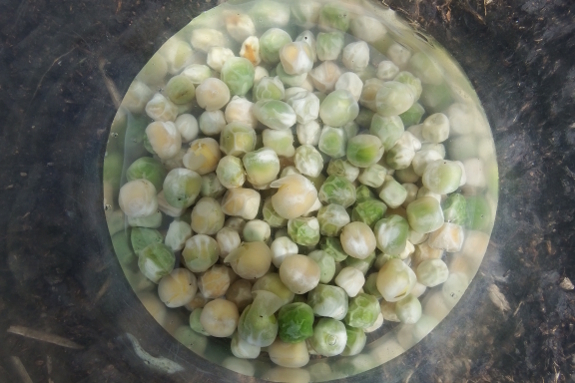 We can handle some winter chicken scratching in the garden, but a minor nuisance becomes potential crop loss once peas are in the ground and seedlings are coming up. 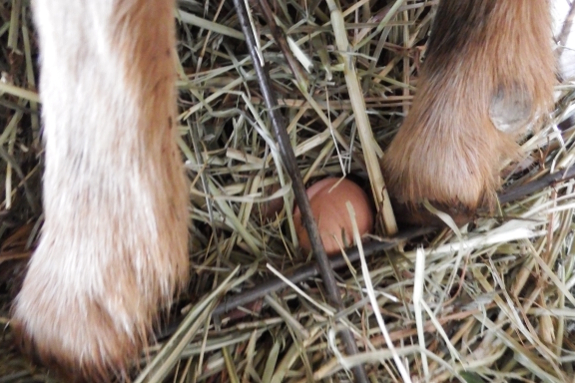 Meanwhile, it seems futile to feed hens if they're hiding caches of eggs under the bee hive or in the goat manger...especially since those infertile eggs won't hatch without a rooster around. 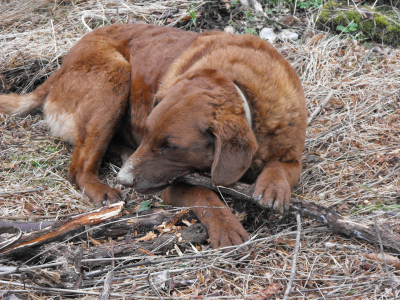 So I've been whittling away the worst offenders, putting them in the old tractor where they can't get into trouble. Three down, at least one more to go...but that last hen is hiding her nest in the barn and I haven't found it yet. Maybe this weekend I'll manage to track her clucking back to its source? It's been almost a year since I first used Flex Seal to make this lid stop leaking. The fix is holding up good and looks like it will last as long as the lid. I'll admit that I'm unimpressed by the lettuce this spring in the cold frame. I suspect the issue is temperature extremes (too hot when I forget to open the glass, too cold when I forget to close the glass) combined with moisture extremes (too dry most of the time, then swamped when water gushes off the roof and onto the baby plants). 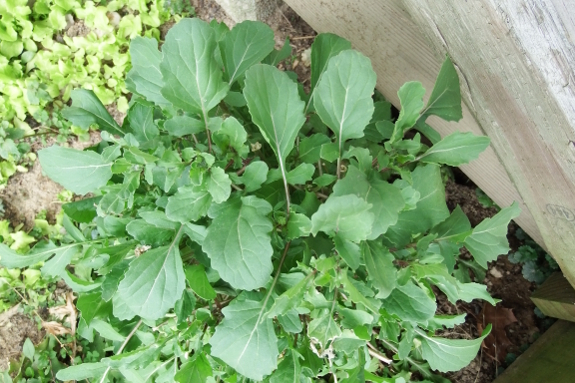 The over-wintering arugula, on the other hand, is going gangbusters. Actually I planted this arugula's parents in October 2015. The plants grew, went to seed last spring, then self-sowed replacement rosettes. 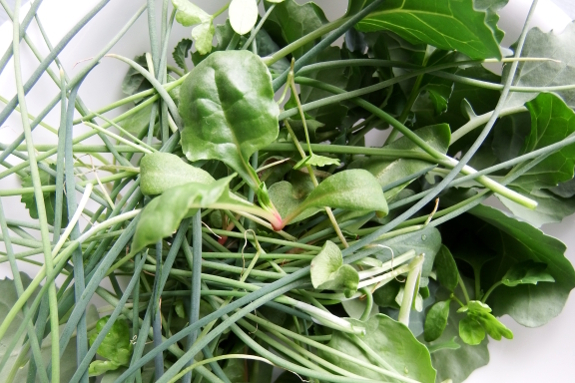 I picked leaves off and on all winter and am now harvesting the rapini heavily to fill spring omelets. At some point, I'll let the poor plants go to seed and repeat the cycle...but I'm enjoying the meals too much to let them go quite yet. Instead, I'm just enjoying seemingly endless arugula, all from one small packet of seeds sprinkled on the ground eighteen months ago. Up until her last day, she offered us more love than we deserved. We love you Lucy. You will be missed. Start with a bowl of thinnings from your vegetable flats. Many (but not all!) vegetables are edible at the seedling stage. In general, figure if you eat the leaves or stems of the adult plant, then the seedlings are probably good to eat as well. Here, I thinned onions, broccoli, parsley, and Swiss chard to add to our salad. Mix seedlings with an equal quantity of spring lettuce, a couple of slices of cooked bacon (crumbled), and a few roasted figs (sliced into small pieces). Top with your favorite salad dressing if you prefer, then enjoy. Early spring flavors at their best! Anna and I want to thank everybody for their kind words and thoughts. We've decided to take the week off blogging to reflect and recharge. We'll start back up on Saturday or Sunday.